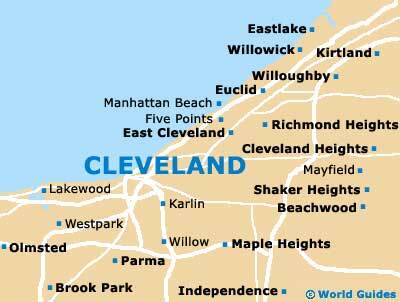 Cleveland is called home by a huge quantity of churches and places of worship, both old and new. 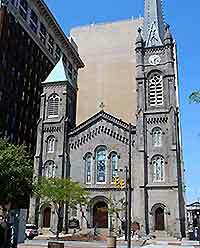 Particularly significant is the Trinity Cathedral on Euclid Avenue, which resides within the campus of the Cleveland State University, next to the Parker Hannifin Hall and the Marshall College of Law, and just a stone's throw from the Krenzler Field soccer stadium. Trinity Cathedral was founded in the early part of the 19th century and construction of the current building started in 1901 and was finally completed in 1907, being added to the National Register of Historic Places just under 70 years later. Standing within the downtown district, Trinity Cathedral is typically Gothic in design and serves as a major center for worship in the city, with many masses, religious events, recitals and concerts throughout the year. Trinity Cathedral is an imposing building and has become a major tourist attraction in its own right. Situated about 10 miles / 16 km east of Public Square, this Catholic shrine is a copy of the original French shine located in Lourdes. The National Shrine of Our Lady of Lourdes attracts many pilgrims and boasts an attractive gift shop and chapel. Daily masses are held at the chapel.